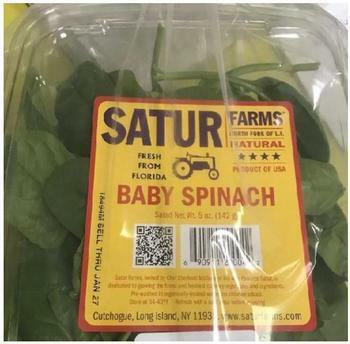 Satur Farms of Cutchogue, N.Y., is recalling Baby Spinach and Mesclun that may be contaminated with Salmonella. The retail product is packed in plastic 5-oz., 10- oz., and 16-oz. plastic clamshell containers with the Satur Farms brand name. The Food service product is packed in 2-1/2 lbs, 3#, 4#, 4 x 2.5#, 4 x 3# sealed poly bags. Consumers with questions may contact Paulette Satur at (631) 734-4219.